The Jewish people are wonderful story tellers. We contributed many of the tales of 1,001 Nights of Scheherazade. We brought the stories of other traditions into our own. I am teaching a course of Jewish folklore and folk tales this month. I hope you will come. More importantly to me, though, is I want to hear your stories, the stories of who you are, and the stories of where you and your family come from. I want to hear the stories of where you want to go in your life, particularly your spiritual and intellectual journey. I tend to meet people at events, where there is not a lot of time to speak meaningfully for more than a few minutes, or at life cycle events where we are mostly focusing on family dynamics or the details of the day itself. Judaism has so much wisdom and so many riches to make our path in life a happy, good and meaningful one. I would love to meet with anyone who has, or has had, or would like a connection to Adat Shalom, at a time and place that is good for you, including your favorite coffee or lunch place and talk about what matters to you and how Judaism can be an even more meaningful part of your life. We could also just chat. 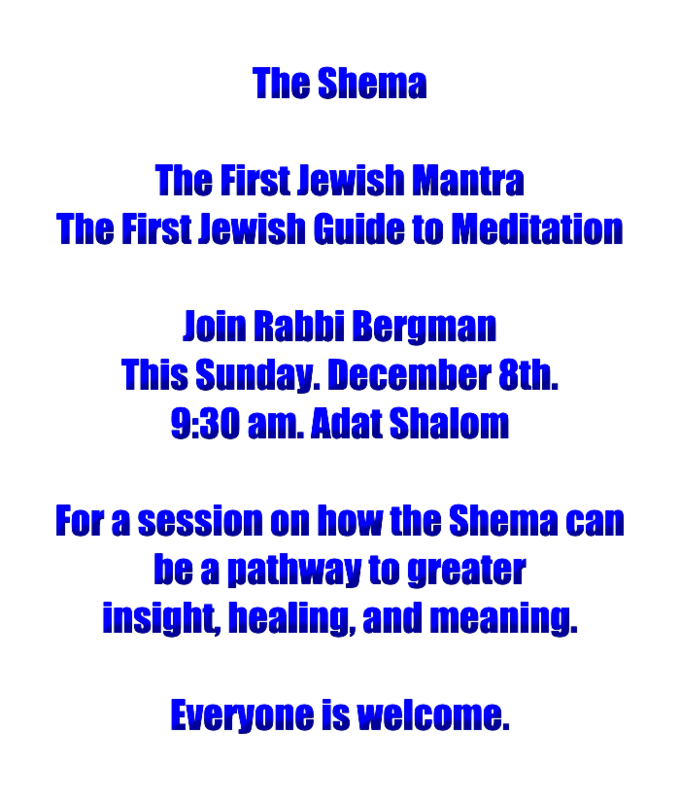 You can contact me through my email, abergman@adatshalom.org, or on Facebook (just make sure you have the right Aaron Bergman, or at the synagogue, 248-851-5100, and ask for my assistant Sheila. I will also be calling Adat Shalom members at random from time to time. No obligation, but I think this could be a lot of fun and very illuminating. I look forward to talking soon. Yiddish is becoming one of the languages of the world musical underground. It is being used by European avant garde and metal groups such as Gevolt and Dibbukim. I am experimenting with creating some modern approaches to Yiddish music that incorporate traditional poems and songs with contemporary melodies and rhythms. This is my first attempt. I created and recorded all the music. The vocals are by Rahel Jaskow. It is pretty ambient and downtempo. The painting is mine, too.